Anna Mellergård, Cultural Coordinator at Arts Nordica, www.artsnordica.com, took in the spring of 2007 contact with Kajsa Haglund in Uppsala. Anna Mellergård which for a long period of time, has lived and worked in Kunming, China founded together with Wu Yue Rong TCG Nordica, a Nordic-Chinese Culture center. Today the cultural centre leads by Wu Yue Rong with the Chinese artists ‘ Corps and TCG Nordica.The following artists have now received an official invitation from Luo Fei, curator and artist and cultural Coordinator at TCG Nordica, Kunming, China.The opening of the exhibition will be on 8/10/2010. by means of artistic processes, examine and analyze how a cooperation between the two cultures can be developed, as well as create understanding. We want to change attitudes, find out what unites and create conditions for meetings through our art exhibitions and through the educational work with children in both countries. The artistic process is carried out in cooperation with the Chinese artists, resulting in two joint exhibitions, in China and Sweden. Can we as artists through our jobs offer a contribution to a better understanding? We wish to work with dialog, with or without words, in order to reach the reflection and reflection. Can we as artists through our jobs, to play with a bet for better understanding? We wish to work with dialog, with or without words, in order to reach reflection. Is it possible to change attitudes and open other senses through artistic projects? Our desire is to build bridges across borders by creating a creative dialogue. A common concept has been developed; the Swedish artists will travel to TCG Nordica In Kunming and together with the Chinese artists organize an exhibition on the theme: everyday events, movement patterns, lifelines. Later, in the fall of 2011, when the Chinese artists come to Sweden we will set up a joint exhibition of the same theme.Contact has been taken with the following institutions for an exhibition: Gallery 1 (Uppsala, the artists ‘ Club), Theatre Gallery, Bror Hjorths Museum, Uppsala Art Museum and libraries across the County.Workshops in schools will take place both in Kunming and in Uppsala County, Sweden. The educational work will consist of the childrens work in serialized visualized form: “A day in my life.”An image story without words. The Swedish report is read from left to right, and the Chinese from right to left. In the middle of the book there will be a meeting and a bridge has been built. Anna Mellergård and Luo Fei contributes with their Chinese contacts and has selected the Chinese artists that we cooperate with. 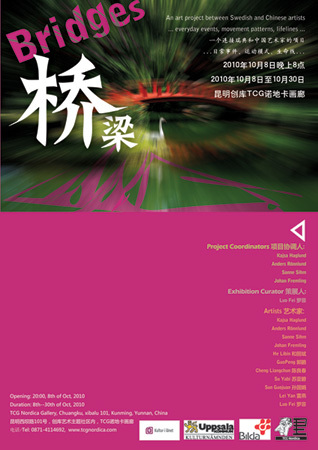 Preliminary schedule is that the Swedish artists exhibit in China by 2010, with opening 8/10, and that the Chinese artists come to Sweden for an exhibition in 2011. Exact date will be determined in cooperation with the relevant institutions. We want through exhibitions and workshops turn to children, students, people in rural and urban areas in both countries. We will conduct workshops in China as well as in Sweden. To create a positive dialogue between our two countries and people and countries in General. We expect an active Exchange and a creative dialogue between Chinese and Swedish culture. We hope through the project BRIDGES found similarities between our countries. By focusing on what unites, we create greater opportunities for conversations and, therefore, understanding and more tolerance for differences. We will disseminate information, experiences and results through exhibition, meetings, workshops, and directory.